Infinitely more than "just a spirit"
The distillation takes place during winter with a limit date of 31st March of the year following the harvest; for several years this date has been brought forward by an annual decree. 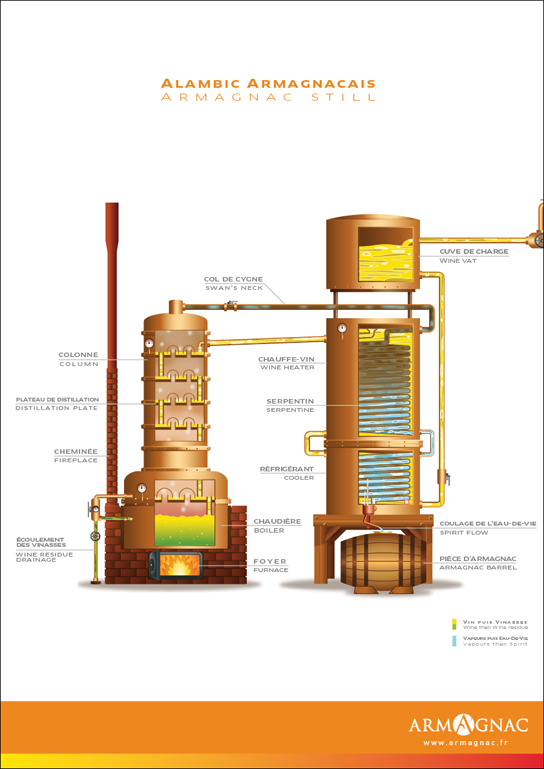 The wine is often distilled on the estate, sometimes using a travelling distiller who goes from cellar to cellar distilling the winemakers’ wine. 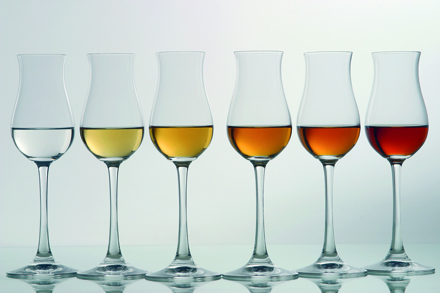 It is also produced in distilleries by professional distillers or cooperatives. Most of Armagnac (about 95%) is obtained using a specific alambic for this eau-de-vie: a continuous Armagnac alambic. It is a pure copper apparatus that was endorsed in 1818 (by a stove maker in Auch, Sieur Tuillière, under the reign of King Louis XVIII), and adapted, modified, improved by the region’s distillers. It truly gives the personality to Armagnac. The wine permanently feeds the alambic from the bottom of the cooler. It is thanks to this that the alcohol vapours contained in the serpentine cool down. It is driven towards the distillation column where it goes down from plate to plate until it reaches the boiler. With the strong heat provided by the furnace, the vapours from the wine pass back up the column and bubble in the wine at the level of each plate. They become enriched with the alcohol and the aromatic substances in the wine before being condensed then cooled in the serpentine. On leaving the alambic, the eau-de-vie is transparent and its alcohol degree can vary between 52% and 72% (though it is traditionally around 52% to 60%). At this moment, the Armagnac is still full of ardour, though it already has great aromatic richness: very fruity (plum, grape) and often floral (vine flowers or lime flower). The ageing in wood will give it its complexity and increasing softness. Once it has been distilled, Armagnac is put to age in « pièces »: 400 litre oak barrels mostly from the forests of Gascony or Limousin. The evaporation of a part of the eau-de-vie and the reduction of the alcohol degree (about ½ degree per year), known as the ‘angel’s share’. The evolution of the aromas coming from the wood and the wine through a slow oxidation of the Armagnac in contact with the air through the barrel. The eaux-de-vie stay in new barrels just until the dissolution level of substances in the wood is optimal. They are then transferred to older barrels in order to avoid an excessive extraction of wood and continue their slow evolution: the substances in the wood become more refined, aromas of vanilla and prunes develop, the « rancio » character appears and the alcohol degree diminishes gradually through the evaporation of the alcohol (the angel’s share). The eau-de-vie takes on a lovely amber colour that then turns to mahogany. Once the cellar master considers that the ageing is sufficient, he will start ‘les coupes’, in other words, making harmonious blends of several eaux-de-vie of different origins and ages. The level of alcohol for consumption (40% vol. minimum) can be achieved by gradually adding ‘petites eaux’ a blend of Armagnac and distilled water that is aged independently and used exclusively for reducing blends. The vintage is a specificity in Armagnac that corresponds exclusively to the year of harvest. Reducing vintages is often not necessary particularly if the cellar is humid so they are often available at their natural alcohol strength of ageing that is generally between 40% and 48% vol. Once in bottles, Armagnac no longer ages though it is important to keep the bottle upright so that the alcohol can’t attack the cork.